SB 555 requires California’s urban water departments and private water companies to audit their systems and report their annual water loss to the state starting in Oct. 1, 2017. AB 1164 bars cities and counties from enforcing laws that prohibit residents from replacing lawns with artificial turf or other drought-tolerant landscaping. AB 401 directs the State Board to report to the Legislature on its findings regarding the feasibility, financial stability, and desired structure of a Low-Income Water Rate Assistance Program. The report will include any recommendations for legislative action that may need to be taken. AB 617 and AB 939 add some clarifications to last year’s Sustainable Groundwater Management Act. AB 1390 and SB 226 add special procedures and clarifications to the groundwater adjudication process. AB 606 will require state properties to modernize irrigation systems and to implement drought tolerant landscaping, with an emphasis on native plants. This bill was proposed earlier this year by the pupils in Ms. Laura Honda’s fourth grade class at Manor Elementary School in Fairfax, CA. In the past two weeks, precipitation in California has been higher than average in the southeast and below average in the northwest. The rock barrier DWR constructed in the Delta in mid-June to protect water quality from saltwater intrusion is now being removed. The work will be completed by mid-November. 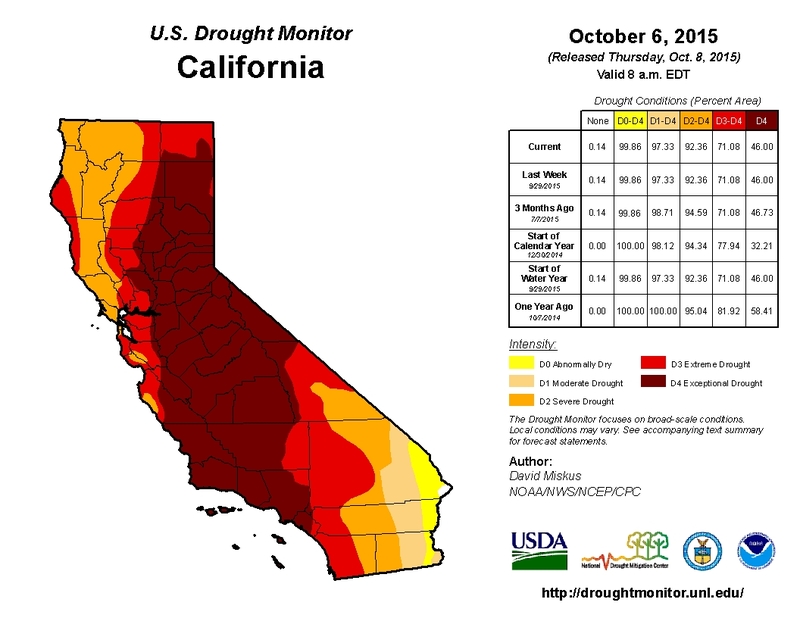 Statewide water use in August was down 27% this year from 2013. Check out the August savings in our interactive data table and map. 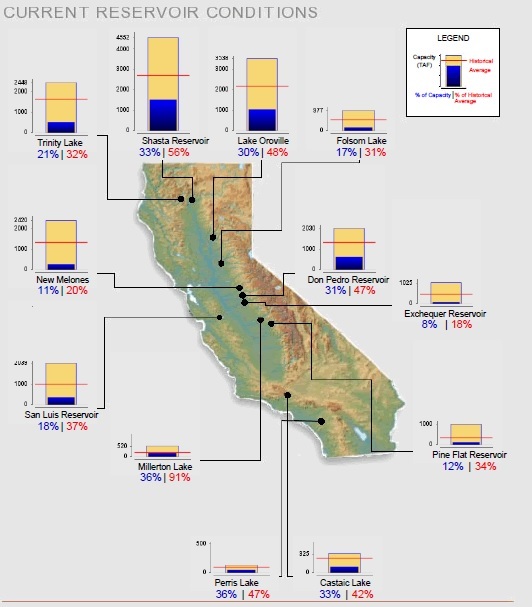 Statewide, California’s major reservoirs (representing 27.3 million acre-feet of storage) are at 27% of capacity and 48% of group average.